Leicester City have sacked manager Claude Puel after 16 months in charge. City were beaten 4-1 at home by Crystal Palace on Saturday in what proved to be Puel's final game. Puel, 57, leaves the club 12th in the Premier League having lost five of their last six league games. The Frenchman guided Leicester to a ninth-place finish in the Premier League in his first season but the club are now looking for their fourth permanent manager in 23 months. Puel had to go - but who next for Leicester? Saturday's defeat meant Leicester have lost four consecutive home Premier League games for the first time since January 2000 and conceded the first goal in 19 Premier League matches this season - more than any other side. Assistant manager Jacky Bonnevay will also leave the club, with first-team coaches Mike Stowell and Adam Sadler set to take temporary charge of the squad. Leicester's next game is at home in the Premier League against Brighton on Tuesday. Puel was appointed on a three-year deal in October 2017, succeeding Craig Shakespeare who in turn followed 2015-16 Premier League winning manager Claudio Ranieri in managing the club. The former Lyon boss had been dismissed by Southampton in June 2017 and arrived at Leicester four months later with the club third from bottom of the league. He led them to ninth in the table, just their second top-10 finish in the Premier League since 2000. Did style cost Puel his job? This season, Leicester have won nine of their 27 league matches, including back-to-back victories over Manchester City and Chelsea over the festive period. But Puel's style of play and recent team selections have been met with hesitation from Foxes fans. Puel incensed some fans by fielding a weakened side against Manchester City in a Carabao Cup quarter-final defeat, with James Maddison and Marc Albrighton starting on the bench, while Jamie Vardy did not feature at all. The Foxes' 2-1 FA Cup defeat at Newport came after Puel made seven changes to his side - with Maddison and Vardy named on the bench - despite choosing five Premier League winners in the starting XI. Striker Vardy, who has scored eight Premier League goals this season and is the club's highest goal scorer this campaign, recently admitted that Puel's tactical approach did not suit his style of play. "Does it? No, but is that down to me to adapt to it? Yes. And obviously the only way I'm going to do that and keep progressing is working hard on the training field," he said. Speculation about the Frenchman's future halted following the devastating helicopter crash outside the King Power Stadium in October, which killed Foxes owner Vichai Srivaddhanaprabha and four others. 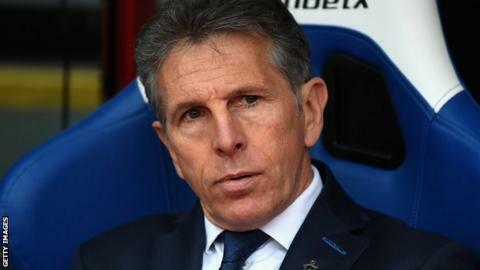 "Playing football has not been at the front of our minds this week," Puel said at his first news conference after the crash. "But for this weekend, and all the matches thereafter, we play to honour a man who did so much for our club." Puel received praise for his dignified approach, and revealed Leicester's players and staff had been offered counselling by the club. 13 July 2015: Former Chelsea manager Claudio Ranieri takes over as manager. 23 Feb 2017: Ranieri is sacked with Leicester a point above the relegation zone with 13 games left.